54 min: Milner is down, grimacing in pain after being wrestled to the floor by Maksimovic. But soon enough he’s up again. 53 min: Mane dribbles with power and determination down the left. He reaches the byline, but can’t decide what to do. The move breaks down. This Liverpool attack has started to second-guess itself; there’s none of last season’s freewheeling panache. A collective confidence issue. 51 min: The corner’s cleared. But it soon leads to another one, as Napoli begin to apply some serious pressure. From the second corner, Fabian Ruiz shoots from the left-hand corner of the box. It’s straight at Alisson, albeit coming through a pack. The keeper does well to snaffle a fierce shot without drama. 50 min: But then a burst of quality from Milik, who spins 30 yards from goal and lashes hard towards the bottom right. Alisson does extremely well to get down and parry; the ball’s hacked out by Gomez for a corner. 49 min: Robertson’s clearance is charged down by Callejon. The ball bounces dangerously on the edge of the Liverpool box. Van Dijk steps in to head powerfully clear. This is all very scrappy. 47 min: Nothing’s quite coming off. Firmino scoops down the middle but Salah stumbles, claiming his ankle had been tapped. Then Albiol looks for Insigne with a long ball, but he misjudges the flight and Gomez can clear. 46 min: Napoli are immediately on the attack. Mario Rui crosses from the left. It’s a towering ball that Robertson does very well to head clear. And we’re back! No changes. The hosts kick off for the second half. “The Napoli blue v Liverpool red is always appealing,” begins Simon McMahon, “but less so when used to advertise mineral water and international banking. What was wrong with Mars bars and Crown Paints?” Yes, I wish I was young again too. Robertson nicks the ball in the midfield and drives forward. Napoli are light at the back, but Salah’s hesitation puts an end to the move. And that’s that for a first half that’s been high on effort, low on quality. A sense that both sides could move up a gear, though. It could be a very interesting second half. 45 min +3: Milik fizzes a ball into the Liverpool area from the left. Alisson claims with Insigne lurking. 45 min +2: Milner is quite rightly booked for a late slide on Allan. He doesn’t bother complaining. 45 min +1: Hamsik, quarterbacking deep on the left, sends a glorious diagonal ball towards Callejon, just inside the Liverpool box on the right. Liverpool are exposed, but the flag goes up for offside; Callejon went way too early. Napoli are beginning to ask a few questions. 45 min: There will be four minutes of stoppage time. 44 min: Koulibaly, who has already been booked, bowls Firmino to the ground in a very clumsy manner. He’ll need to be careful with that carry-on. 43 min: Henderson dinks a ball down the left and into the Napoli box. Firmino thinks he might be offside – he isn’t – so leaves it to Robertson instead. Robertson can’t get there in time for a meaningful cross. Firmino was in a lot of space there; a costly misjudgement. 42 min: Firmino spins Albiol in the centre circle and prepares to drive forward. Albiol drags him back, and should really be booked, but the referee is lenient. Liverpool’s Roberto Firmino is hauled back by Napoli’s Raul Albiol . 41 min: A free kick for Napoli out on the right, and a chance to load the box. Callejon’s delivery is dismal, Alisson punches clear, and there were three Napoli players offside anyway. 39 min: Milik has the chance to release Insigne into the Liverpool area down the inside-left channel. But he puts too much juice on the pass and it’s a goal kick. Liverpool were light at the back there; they breathe again. 38 min: Robertson tears past Callejon on the left. He curls into the box. Salah brings it down and has a snap-shot that’s blocked pretty much the second it leaves his boot. The ball breaks right to Alexander-Arnold who shoots high and wild. 37 min: Alexander-Arnold fires a pass down the right for Salah, who spins on the edge of the area and tries to tee up Mane with a square pass. The ball clanks off Albiol and into the arms of Ospina. Liverpool’s attack still isn’t quite clicking. 35 min: Space for Alexander-Arnold down the right. He crosses. Albiol clears, but only to Firmino, who crosses again from the right. With Mane lurking, Ospina comes off his line and punches clear with great feeling. He also manages to clatter into poor old Albiol, who requires a mop-down with the magic sponge as a result. 33 min: Milner and Firmino combine nicely down the right. The latter then slips a pass down the wing and nearly releases Salah, but the excellent Koulibaly slides in to hook clear. That was sensational defending on the edge of his own area. Napoli then go straight up the other end and finally force Alisson into serious action, Milik taking down a left-wing cross, swivelling on the penalty spot, and shooting for the top left. A strong arm denies him. That’s a fine effort, and a very decent save too. 31 min: Insigne and Callejon nearly open Liverpool up with a clever combination down the inside-right channel, but Robertson reads the danger and smashes the ball clear. This match has been intense; the quality’s just been a little lacking so far. 30 min: It’s raining now in Naples. Alexander-Arnold throws long into the Napoli area from the right. Salah tries to make something happen, but Koulibaly stands firm and won’t be passed. 28 min: Mane turns Maksimovic and sprints into space down the left … but he’s penalised for slyly nudging the Napoli full back to the ground as he sent him spinning. 26 min: Wijnaldum dribbles a dismal shot wide left from 20 yards. Ospina’s had to make a couple of clearances from outside his box, but he’s not been forced into a save yet. 25 min: Koulibaly barrels down the left, knocks the ball head of him, and turns on the jets. Van Dijk comes across to intercept, and is cleaned out by the big Napoli defender for his trouble. That really was a clash of the titans. Van Dijk rolls over spectacularly, and Koulibaly is immediately booked. That was a proper clatter, but clumsy as opposed to aggressive. Van Dijk is up and about again soon enough. 23 min: Space for Fabian Ruiz down the left. He hooks long, and Callejon tries to van Basten one in at the far post. That doesn’t happen. But this match continues to be open and entertaining. 21 min: Henderson is quickly into the action, raking a glorious right-to-left pass towards Robertson, and nearly setting the left-back clear. Not quite. Liverpool then stroke it around the back awhile, a tribute to the Bob Paisley era. A lot of whistling from the crowd. 19 min: Keita is being loaded onto a stretcher. He’ll be driven away in a cart. Henderson will come on in his stead. Liverpool will hope that’s not too serious; he’ll be a big loss to their midfield if he’s out for any length of time. 17 min: Insigne nicks the ball past Keita and has a lash from distance, looking for the top right. Not quite. Then a worrying moment for Liverpool, as Keita goes down holding his back and left leg, under no challenge. He looks in some distress. He’s shaking his head. Staff medics tend to Liverpool’s Guinean midfielder Naby Keita after he was injured. 15 min: A poor Allan backpass nearly allows Salah a clear run on goal. Fortunately for Napoli, Ospina was out of his area quickly to blooter clear. 14 min: Callejon carves a glorious diagonal pass with the outside of his boot towards Mario Rui on the left. Alexander-Arnold holds his ground, forcing Napoli to turn back. But they’re soon pressing again, and force van Dijk into a wild slice out for a corner. Nothing comes from the set piece, but that was uncharacteristically nervy from van Dijk. 12 min: This is a very entertaining end-to-end game. Firmino rolls a ball down the right for Salah, who tries to engage Koulibaly in a foot race. But the big defender positions himself well, and Salah can’t squeeze past. 10 min: Salah, Mane and Firmino buzz down the inside-right channel. Suddenly the ball breaks to Salah in the box. He tries to swivel and tee up Firmino, but the pass is all wrong. Napoli go up the other end, finding Insigne in acres on the left, just inside the Liverpool box. He drags a low shot across the face of goal and inches wide right. Alisson had it covered, but Liverpool were exposed there. 9 min: This is high-octane stuff, and all a bit wild. Both teams playing at 110mph. A feeling that, all of a sudden, one of them will click into a move that carves the other open. But passes aren’t quite sticking. 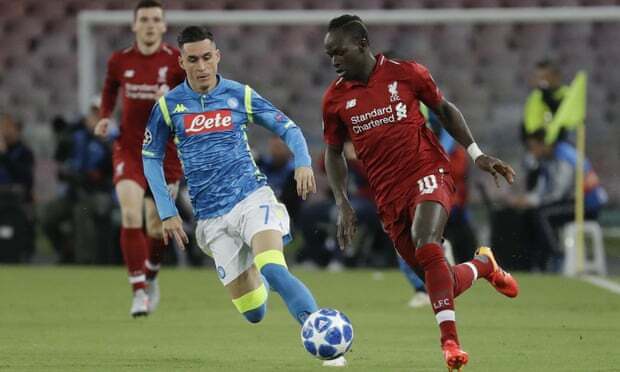 Liverpool’s Andrew Robertson (left) and Napoli’s Jose Callejon vie for the ball. 7 min: A long pass launched down the middle by Albiol. Callejon is caught offside. Then Kieta fires a pass up the Liverpool left, with the hosts light at the back, but Mane goes too early and the flag goes up. 5 min: The game goes a bit scrappy. Allan sees quite a bit of the ball for Napoli; Milner a fair bit for Liverpool. Possession coming at a premium right now. 3 min: Maksimovic makes a nine-course tasting menu of Keita accidentally standing on his toes. He eventually gets up. On the touchline, Klopp looks bemused at the carry-on. 2 min: Allan rolls a pass down the right for Callejon, whose gallop is stopped by van Dijk’s interception. Mane tries to counter down the Liverpool left, but is quickly crowded out of it. A lively start by both teams, who are looking to get on the front foot. And we’re off! Liverpool get the ball rolling. Milner quickly passes long down the right, and Firmino very nearly gets in on goal within 30 seconds! But Ospina has read the danger and is quickly out to clear without drama. The teams are out! And it’s a pretty picture, because Napoli are in their famous Gulf-of-Naples-referencing azure shirts, while Liverpool sport their storied red. One for the purists. Jurgen Klopp and Carlo Ancelotti take to the pitch arm in arm, like a couple of swells. All sweet and friendly. Meanwhile in world-exclusive breaking news, there’s a wonderful atmosphere at the Stadio San Paolo. We’ll be off in a minute or two! It ends 6-1 at the Parc des Princes. PSG top Group C right now, leading Liverpool on goal difference, though that situation won’t last for more than a couple of hours. They’ll be knocked off by Napoli, should the Italians win tonight, or Liverpool, should Jurgen Klopp’s side manage at least a draw. Neymar completes his hat-trick! He whips a free-kick over the Red Star wall and into the top-right corner from 25 yards. It’s 6-1. That was sensational, not least because Milan Borjan was rooted to the spot; free kicks always look better when the keeper’s feet are planted and he’s impotently watching the ball whistle past him. And now it’s 5-1! Marko Marin lashes a consolation for Red Star on 73 minutes after being put through down the inside-right channel by a cute dink from Lorenzo Ebecilio. Then straight from kick-off, Angel Di Maria should have made it 6-1, but shanked one wide from eight yards. A fair chance this won’t be the final score. It’s now 5-0 to PSG at the Parc des Princes. Kylian Mbappe has joined the party, scoring on 70 minutes. He should have made it six seconds later, with the ball at his feet just inside the Red Star area, but his attempt at a curler into the top left flew miles off target. The Champions League might be a licence to print money. But there’s no point frittering away cash just for the sake of it. Nets don’t come cheap, and so the Napoli groundstaff have been out fixing a gaping hole they discovered in one of the goals. And what a good job they’ve done too, because Uefa officials have since run the rule over their knot-tying capabilities, tugging the net a bit, umming and aahing awhile, finally declaring it fit for purpose. Does a bit of make-do and mend qualify as pre-match drama? I’ve got nothing else, so it’ll have to. We’ve published more exciting photos in the past, to be fair. Napoli make three changes to the side that went down 3-1 at Juventus on Saturday. Dries Mertens, Piotr Zielinski and Elseid Hysaj will be sitting on the sidelines, watching Arkadiusz Milik, Fabian Ruiz and Nikola Maksimovic take their places. Just one change to the Liverpool XI sent out at Chelsea last Saturday. Naby Keita takes the place of captain Jordan Henderson, who drops to the bench. An exciting move by Jurgen Klopp: amid all the hubbub surrounding Daniel Sturridge’s sensational late equaliser, Keita’s impressive late cameo at Stamford Bridge went a little under the radar. Napoli: Ospina, Maksimovic, Koulibaly, Albiol, Mario Rui, Allan, Hamsik, Fabian, Callejon, Milik, Insigne. Subs: Karnezis, Hysaj, Diawara, Rog, Zielinski, Mertens, Verdi. Liverpool: Alisson, Alexander-Arnold, Gomes, van Dijk, Robertson, Milner, Wijnaldum, Keita, Mane, Salah, Firmino. The state of play in Group C. Unless something very psychedelic happens in the second half of the early kick-off at the Parc des Princes, Liverpool will go into this match in second position on goal difference. That’s because Paris Saint Germain are 4-0 up at half-time against a ragged Red Star, Neymar scoring twice, Edinson Cavani and Angel Di Maria contributing the others. Neymar could have had another two goals in the one minute of stoppage time, too. It’s fair to say PSG have secured three points there. Napoli and Liverpool don’t have much of a shared history. The only time they’ve locked horns in Europe was in 2010, when they were drawn in the same Europa League group. The pair drew 0-0 in Naples, then in the return at Anfield, Liverpool sent out this team: Reina, Johnson, Carragher, Kyrgiakos, Konchesky, Poulsen, Spearing, Shelvey, Meireles, Jovanovic, Ngog. Their manager was Roy Hodgson. It’s fair to say the mood around the place is a wee bit better these days. Credit where it’s due, Liverpool won that night. Steven Gerrard came off the bench and scored a 13-minute second-half hat-trick to wipe out Ezequiel Lavezzi’s first-half goal. It was the last time the teams met. If you offered Liverpool a 3-1 win tonight, they’d grab it with both hands. A 0-0 would probably do them as well. Oh Roy! The Kop hardly knew ye. Actually they had a fair inkling, and acted accordingly. And now, seven years and 11 months on, Liverpool are a serious proposition in Europe. Finalists in this tournament last season, of course, but that doesn’t mean qualification for the knockout phase this time round is a given. Group C’s a toughie, and this trip to Stadio San Paolo will be one hell of a test. Napoli were runners-up in Serie A last season under the yoke of entertainment’s Maurizio Sarri. They’ve won five of their first seven Serie A games this season, while their new boss has a little history with Liverpool in this competition. Carlo Ancelotti was manager of Milan when they faced the Reds in the 2005 and 2007 finals. I’ll not insult your intelligence by telling those stories again, though in Athens, Rafa Benitez should have played Craig Bellamy and put on Peter Crouch a lot earlier, that’s all I’m saying about that. Anyway, this promises to be a fine match between two enjoyable sides. And good luck predicting it, because Napoli have lost two of their last three home fixtures in Europe, while Liverpool’s last visit to Italy saw them go down 4-2 at Roma in last year’s semi, their heads swimming a little by the end of it. It’s the Partenopei! It’s the Reds! It’s on!